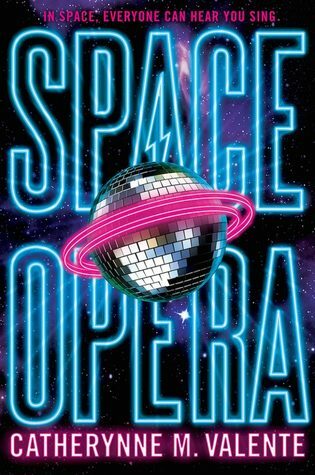 All in all, Space Opera was good fun—as you would expect from a novel with its loud and glittery cover, quippy tagline, and punny title. Its premise is most certainly guaranteed to be nothing you’ve ever seen before, full of lightness and frivolity, but there’s also a lot of heart and meaning. That said, I was still glad when the book finished when it did, before we started going overboard with the comedic shenanigans and lengthy asides. Valente might have wound up overdoing it in the end anyhow, but then managed to pull it back just in time for a satisfying conclusion. You should give it a try! I think you’ll like it if you like her other books. This seemed different even from the other books I’ve read by her, but I would be the first to admit I’m not as experienced with her work, so who knows! And yeah, the slapstick was not really working for me, I’m glad that was kept to a minimum! Yes, the story is totally wild! If the summary piqued your interest, you should check it out! Does one need to know HGTTG to enjoy or read this pne? Nope! I think those who have read it will have a better understanding of what Valente was trying to do, but you definitely don’t need to have read it as a prerequisite. Yeah, I have a feeling this one won’t be for everyone! I wasn’t a fan of Hitchhiker’s, but I did have fun with this one. It sounds like we had a very similar experience with Space Opera. I love her imagination so much, but I got fatigued, too. Yeah, if this had gone on any longer, I might not have had such a good time with it. I liked the style of humor, but also to a certain point, lol! I can only take it in small doses. This one sounds fun – I definitely have it on my TBR as a beach read for the summer! I tried this one but after two chapters my brain couldn’t handle the writing style unfortunately! that’s too bad because it sounds like great fun ! !